Jaythen felt ill, her whole body ached but she must have slept for it was now several hours later. She stumbled out of the bed and attempted to pull the clamp from her ankle but it was hopeless. All she managed to do was to make it bleed. She remembered that a tinderbox and lamp were somewhere across the room so she crawled forward and felt around. Her hands touched a small shelf but she was at the end of the chain and could not reach a thing. She heard scratching. Anger and self-pity turned to terror as she glanced into the darkness where the door was. There was definite scratching. “Who are you!” she called. The scratching stopped but her heart raced. That could a wee kitten do to help anyway? She heard a thud of feet. Something was running outside and it was far bigger than Pixie. There was a thud and the door rattled. Jaythen strained her eyes. She could see a faint line along the side of the wall. That’s it; the door had moved a fraction. Somebody was trying to break it down. It was silent outside. She listened and heard running again. There was an almighty splitting noise and the gap widened. She could now see top and bottom lines as well as the side one. “It’s coming!” she screamed. The third bump on the door was in a different spot. The top left hand corner split and more light shone in. Jaythen’s excitement turned to fear. She could see four massive claws poking through the gap. They pulled on the broken wood before retreating. “What are you?” she cried. The claws appeared again, seized a section of wood and ripped it out. Oh my God, two yellow eyes stared unblinking at her. They disappeared, she heard pounding and another crunch. The door shook, timbers groaned and it fell inwards in a shower of splinters. Light poured in and for a second, the girl was blinded. She wiped her eyes and held her hand up to shade them. A massive cat stood there! It was over two meters long with a sleek coal black body and those yellow eyes. It looked at her and crawled in between the splintered wood. Jaythen calmed down. The beast held its tail up. Didn’t an angry cat always wag its tail? Its eyes too looked kind, almost compassionate. “Have you come to help me, panther?” she asked. 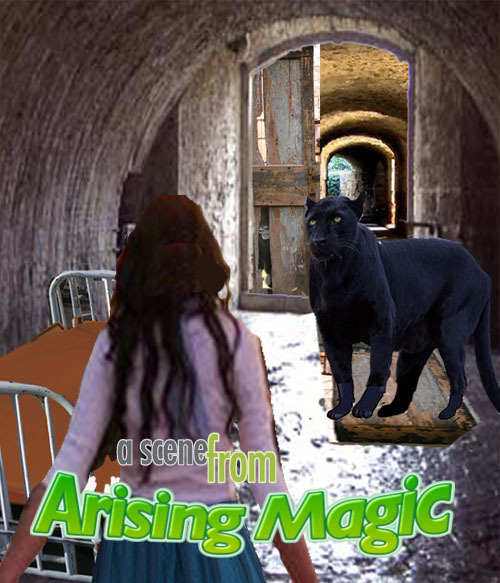 “I’m chained to the wall,” Jaythen said as she continued to pat the panther. When her hand went down its neck she found a collar. “You’re someone’s pet?” she said. Jaythen. This is Rochelle. She is a wild beast but has come to help you. Make your way to the top of Tower Four and lock yourself up there. Don’t worry. Other friends have distracted the guards. Rochelle will wait with you until dawn when other friends will come for you. Sliver. Sliver. Jaythen frowned. She had heard the name somewhere before. Rochelle stood up and wagged her tail twice. The panther gazed at her and wagged his tail once. The panther stared at her and wagged her tail just once. “But I’m chained to the wall, Rochelle,” Jaythen’s voice became apprehensive. “It’s so tight around my ankle I doubt if even you can get it off. Look!” She sat on her bottom and stuck her foot out. The iron clamp and padlock were attached to a chain made up of links about three centimeters across. “You’ll never break it,” she said. Rochelle sniffed at the clamp and brought a paw up. Her claws stretched out and gave the clamp a tug. She licked Jaythen’s ankle and gave the padlock another tug but it remained secure. “Don’t give up. Please don’t give up.” The girl broke into a sob. The padlock was still attached to the hook but this was hanging in Rochelle’s claw a half a meter away from a hole in the wall. “I know,” the girl said. “I’ll need things.” She stood up, found the tinderbox and lit the lamp. “I’ll go bare feet,” she said and glanced in the small mirror on the wall. She gulped at her reflection, the cut lip, blackened eyes and the ugly tufts of hair that remained. “I’m like a monster,” she cried. Rochelle licked her hand and wagged her tail twice. The panther walked to the door and slid out. Jaythen had to wriggle to fit through the damaged door. Her bruised ribs sent a spasm of pain through her body but she gritted her teeth and continued. Once outside she stood up and glanced around.